The gingiva, or gums, are part of the soft tissue lining of the mouth. The gingiva surrounds the teeth and provides a seal around them. 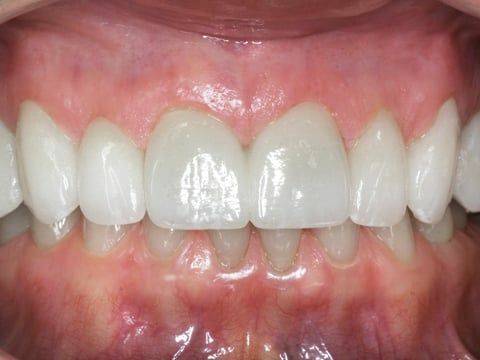 Compared with the soft tissue linings of the lips and cheeks, most of the gingiva is tightly bound to the underlying bone which helps resist the friction of food passing over it. Thus, when healthy, it presents an effective barrier to the barrage of insults to deeper tissue. Healthy gingiva has a stippled appearance and is usually coral pink in color, but may contain melanin pigmentation as well. Research further suggests that gum disease may be a more serious risk factor for heart disease than hypertension, smoking, cholesterol, gender and ages. Researchers conclusions suggest that bacteria present in infected gums can become loose and move throughout the body through the bloodstream. Once bacteria reach the arteries they can irritate them in the same way that they irritate gum tissue causing arterial plaque which builds up and can affect blood flow. Dental plaque is a biofilm, usually a pale yellow, that develops naturally on the teeth. Like any biofilm, dental plaque is formed by colonizing bacteria that attach themselves to the tooth's smooth surface. Once sugars are introduced to plaque, it turns into a tooth eating acid that sits just above the gum line. If regular oral care isn't standard, the acid will start eating at the teeth producing cavities and the plaque will cause gum disease. Plaque that is allowed to sit for a prolonged period of time can cause cavities, gingivitis, and other problems in your mouth. If it's left longer than that, serious dental procedures may be required to restore your decaying smile. Gingivitis is an early stage of gum disease. Gingivitis develops as toxins, enzymes and other plaque byproducts by irritating the gums, making them tender, swollen and likely to bleed easily. Gingivitis generally can be stopped with proper oral hygiene and minor treatment from your dentist. If this is achieved, your gums can return to a healthy state.